, an eminent Romish saint and cardinal, was born the 2d of October 1538, of a good family, in the castle of Arona, upon lake Major in the Milanese. He addicted himself at an early period to retirement and study. His maternal uncle, Pius IV. sent for him to the court of Rome, made him cardinal in 1560, and afterwards archbishop of Milan. 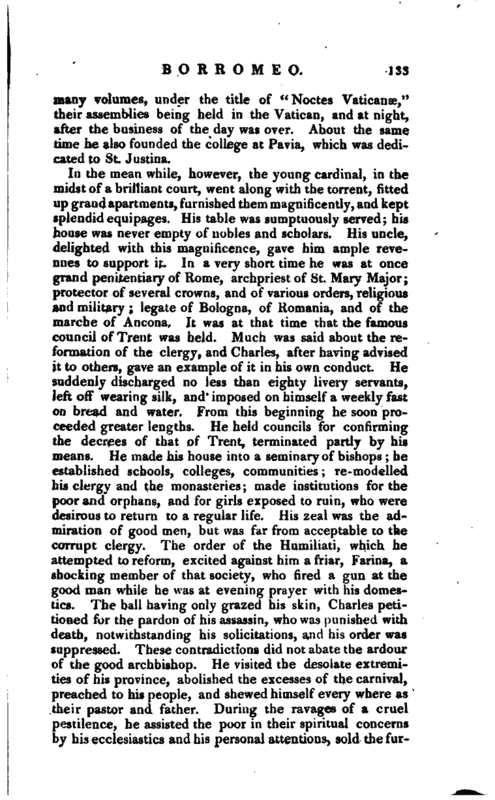 Charles was then but 22 years of age, but conducted the affairs of the church with disinterested zeal and prudence. 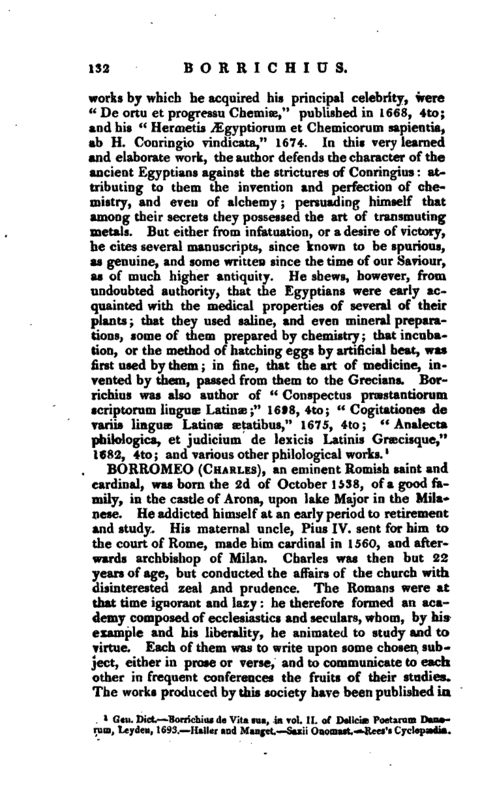 The Romans were at that time ignorant and lazy: he therefore formed an academy composed of ecclesiastics and seculars, whom, by his example and his liberality, he animated to study and to virtue. Each of them was to write upon some chosen subject, either in prose or verse, and to communicate to each other in frequent conferences the fruits of their studies. The works produced by this society have been published in | many volumes, under the title of “Noctes Vaticanas,” their assemblies being held in the Vatican, and at night, after the business of the day was over. About the same time he also founded the college at Pavia, which was dedicated to St. Justina. In the mean while, however, the young cardinal, in the midst of a brilliant court, went along with the torrent, fitted up grand apartments, furnished them magnificently, and kept splt-ntiid equipages. His table was sumptuously served; his house was never empty of nobles and scholars. His uncle, delighted with this magnificence, gave him ample revenues to support it. In a very short time he was at once grand penitentiary of Rome, archpriest of St. Mary Major; protector of several crowns, and of various orders, religious and military; legate of Bologna, of Romania, and of the marche of Ancona. It was at that time that the famous council of Trent was held. Much was said about the reformation of the clergy, and Charles, after having advised it to others, gave an example of it in his own conduct. He suddenly discharged no less than eighty livery servants, left off wearing silk, and imposed on himself a weekly fast on bread and water. From this beginning he soon proceeded greater lengths. He held councils for confirming the decrees of that of Trent, terminated partly by his means. He made his house into a seminary of bishops; he established schools, colleges, communities; re-modelled his clergy and the monasteries; made institutions for the poor and orphans, and for girls exposed to ruin, who were desirous to return to a regular life. His zeal was the admiration of good men, but was far from acceptable to the corrupt clergy. The order of the Humiliati, which he attempted to reform, excited against him a friar, Farina, a shocking member of that society, who fired a gun at the good man while he was at evening prayer with his domestics. The bail having only grazed his skin, Charles petitioned for the pardon of his assassin, who was punished with death, notwithstanding his solicitations, and his order was suppressed. These contradictions did not abate the ardour of the good archbishop. He visited the desolate extremities of his province, abolished the excesses of the carnival, preached to his people, and shewed himself every where as their pastor and father. During the ravages of a cruel pestilence, he assisted the poor in their spiritual concerns by his ecclesiastics and his personal attentions, sold the | furniture of his house to relieve the sick, put up prayers and made processions, in which he walked barefoot, and with a rope round his neck. His heroic charity was repaid with ingratitude. The governor of Milan prevailed on the magistrates of that city to prefer complaints against Charles, whom they painted in the blackest colours. 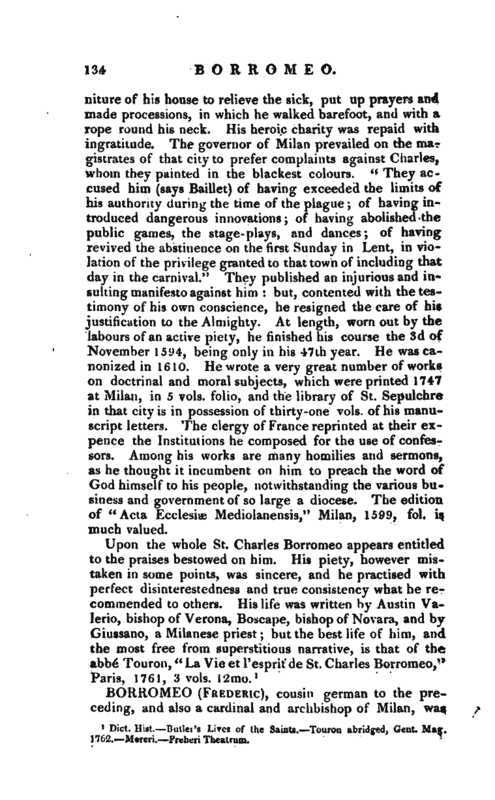 “They accused him (says Baillet) of having exceeded the limits of his authority during the time of the plague; of having introduced dangerous innovations; of having abolished the public games, the stage-plays, and dances; of having revived the abstinence on the first Sunday in Lent, in violation of the privilege granted to that town of including that day in the carnival.” They published an injurious and insulting manifesto against him: but, contented with the testimony of his own conscience, he resigned the care of his justification to the Almighty. At length, worn out by the labours of an active piety, he finished his course the 3d of November 1594, being only in his 47th year. He was canonized in 1610. He wrote a very great number of works on doctrinal and moral subjects, which were printed 1747 at Milan, in 5 vols. folio, and the library of St. Sepulchre in that city is in possession of thirty-one vols. of his manuscript letters. The clergy of France reprinted at their expence the Institutions he composed for the use of confessors. Among his works are many homilies and sermons, as he thought it incumbent on him to preach the word of God himself to his people, notwithstanding the various business and government of so large a diocese. The edition of “Ada Ecclesiae Mediolanensis,” Milan, 1599, fol. is much valued. Dict. Hist.—Butler’s Lives of the Saints.—Touron abridged, Gent. Mag. 1762.—Moreri.—Freheri Theatrum.